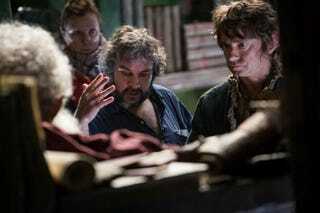 Peter Jackson on The Hobbit trilogy: "(I was) winging it." There’s a writeup on The Guardian today regarding the hardships Peter Jackson faced while adapting J. R. R. Tolkien’s beloved novel into three major blockbusters after the original director, Guillermo del Toro, exited the project after long delays caused by litigation. “Because Guillermo Del Toro had to leave and I jumped in and took over, we didn’t wind the clock back a year and a half and give me a year and a half prep to design the movie, which was different to what he was doing,” reveals Jackson. “It was impossible, and as a result of it being impossible I just started shooting the movie with most of it not prepped at all. I personally didn’t like the movies, but I can imagine how stressful it must have been for the crew to meet an extremely aggressive release schedule. The quotes in the writeup actually come from the behind-the-scenes documentaries that are released with the extended edition releases of the movies. I find them much more enjoyable than the movies themselves, and they are quite illuminating.